I’ll try to explain step by step how I make a Bowie sheath. First I make a paper template then I cut the leather: here leather vegetal tanning 1st choice origin France (thickness 3.3 / 3.6 mm). 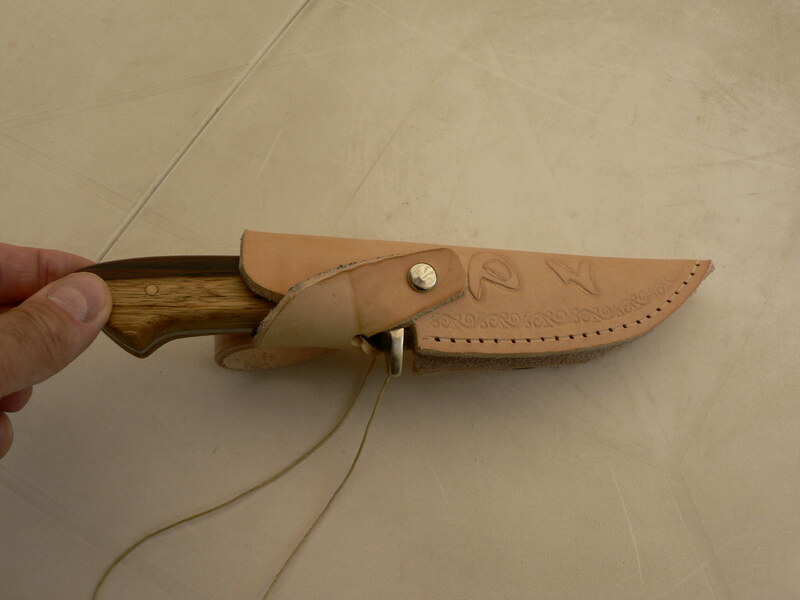 My wish is that belt loop is on the side of the grain leather (it is more aesthetic), some people (I also did it: it’s easier) return the back so that it is the split leather is side handle of the knife. Another constraint I add layers of leather to compensate for the width of the guard, 2 layers here about 1/2 cm. On this model I made for the first time (but I think I’m not the first!) a cut to the thigh holster side there is a single leather thickness (it’s more complicated! ). It is glued, riveted and sewn so it should take !! I put of course a “martyr” (leather piece that goes around the sheath and protects the seam of the cut by the blade hence the name « martyr » it is he who takes the shots!). I also added side upper part of the blade a thickness which is tapered, it serves to compensate for the thickness of the back of the blade. On this model I left a piece of leather to tie a leather lace. This is done so that in case of uselessness or discomfort this piece of leather can easily be cut with a simple cutter. The decoration is made with wet leather stamps and the leather is dyed. Then the connection is maintained by gluing. I practice a groove in leather with a special gouge so that the thread takes place in that throat and protects friction. For holes in this case because of the thickness (about 18 mm thicker) I use the drill press, in fact it is impossible to go through with an awl. Then comes the sewing thread waxed with 2 needles with round ends, it takes more than 4 m of thread !!! I cross the wire and make a loop at each point, so that in case of breakage of the wire to a point the rest does not move. I do not forget to use edge skiving tool on the edges. I check and eventually made a dye retouching. For slices I use a beeswax block and an electric soldering iron. Then I gloss edges, I made a small tool I use on drill: they are leather discs (diameter 4-5 cm) stacked to a thickness of about 3 cm. These pieces of leather are kept in a holder for polishing pad for drill. Finally I finish putting a product for leather. Sorry for my so bad english! !